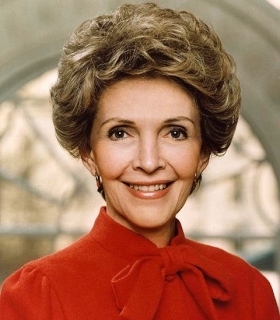 Nancy Reagan was many things—a glamorous movie star in 1950s Hollywood, a member of the Junior League of Los Angeles, a First Lady of the United States, a spokesperson for the prevention of drug abuse, and an ardent supporter of stem cell research. Nancy’s public life began in Hollywood where she starred in movies at MGM. After her husband Ronald Reagan was elected Governor of California, he appointed her to the California Arts Commission. As California’s first lady, she visited the elderly and the handicapped, and worked with a number of charities, including the Foster Grandparents Program. She was named the Los Angeles Times' Woman of the Year. With the election of her husband to the White House in 1980, she began the work that would be her legacy of public service. As First Lady, she championed the national movement to prevent drug abuse, serving as the spokesperson for the “Just Say No” campaign, and raised private funds for a badly needed renovation of major portions of the White House, including the family wing. When she returned to California home in 1989 after the presidency, Nancy devoted herself to the care of her ailing husband, who was later diagnosed with Alzheimer’s disease, until his death in 2004. She remained active in public life, both in support of the Ronald Reagan Presidential Library and in advocating for embryonic stem cell research.